I was recently watching Ask This Old House and they did a segment on water heater safety. Because water expands as it heats, your tank is essentially a pressured tank that can explode if there aren't safety measures in place. One of the safety measures on all tanks is the Temperature and Pressure (T&P) valve. If the tank gets above 210 degrees the T&P valve will release steam from the pipe that runs down the side of your water heater to lower the pressure. If you see water around the pipe or witness steam coming from the pipe, it's time to have your T&P valve replaced and your water heater serviced. So, PSA time: don't ever cap the pipe you see on the side of your water heater. If you're seeing water from the pipe, have your water heater serviced. Last week I noticed water around the water heater and surmised that it came from the T&P valve on my heater. I knew that I could replace the valve myself but I was worried about WHY our water heater was getting so hot, so I called American Plumbing Services. Because I'm about a mile and half from them, he offered to charge me by the quarter hour, instead of their usual base rate of 1 hour. My total cost was $51, which was totally worth it. I had a Thanksgiving dinner to plan! I highly recommend APS, if you're in the Portland area. They were fantastic. They replaced the valve and said to call them if it starts releasing water again, because that could mean our thermostat is going bad and letting the water get too hot. 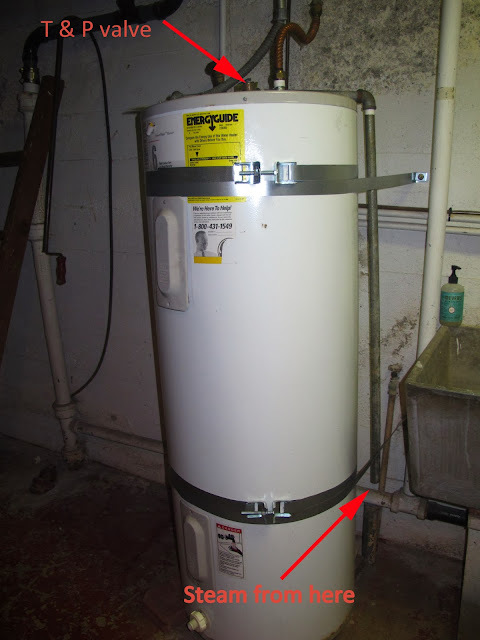 This is another reason not to crank your water heater beyond 120 degrees. So go check your water heater, make sure the T&P valve isn't capped, and then maybe flush your water heater of sediment while you're there. It takes about two minutes and you'll extend the life of your appliance. Ahhhh...it's good to know what the warning signs are...I fret about this all the time. I still remember the rare occurrence of farmhouse boilers exploding and totally demolishing everything near them...it was terrifying! I've seen that freaky episode of Mythbusters. Thanks for the tips! I'm going down to the basement and check …right now ! Any tips on heat pumps not running on this freezing day ? Well this post was timely! We spent the three days before Thanksgiving with no hot water at all. Our tank died and leaked all over the floor and had to be replaced, but the replacement tank must have come from a very special place, because they could not get one for 3 days. No shower, no washing up for 3 days was horrible. A first world problem, but still -- take care of your water heater! And good safety advice in this post too. Richard worries about these kinds of things. Without him, I would have to go back to living in an apartment with a super and taking mass transit because I blithely grind through cars for lack of attention to things like oil guages. Coincidence. We just saw the Mythbusters road show Last NIght and they had a water heater and discussed the episode and showed a clip but there were no explosions. We went with an on demand gas/heater when we had to replace ours. It takes a looong time to get hot water. It is mounted outside. We should probably add more insulation to the pipes in the basement. I still worry about explosions. But I guess it wouldn't take out the WHOLE house. Safety warning or way to get one's homeowner's insurance to pay for a total remodel? Interesting... Seriously, thanks for sharing this tip; I had no idea! Is the T&P valve breaking a dangerous happening? I am guessing it might be since you've included a video of the Myth Busters guys. They always seems to deal with things that could break in very significant ways. Now, I know what to look out for if my water heater starts to steam.